Register to receive a free Europe Market Report Suite for Dental Operatory Equipment – MedSuite report synopsis or brochure. Most American dentists tend to support their national economy by purchasing American-made products. This is exemplified by the success of A-dec, leader of the dental operatory equipment market and a company that proudly manufactures every part of their cabinets in the United States, down to each individual screw. However, recently there has been pressure in the United States to progress towards European style devices due to the growing preference by dentists. This trend is most evident in the dental autoclave and ultrasonic scaler markets. A dental autoclave is a piece of equipment that ensures all other necessary equipment, such as dental handpieces, are being properly sanitized in between patients. The most common autoclaves work by applying high-pressure steam to destroy left-over pathogens and bacterial spores that remain on the equipment after the first round of washing. The equipment is placed into the chamber of the autoclave and the door is then closed and locked to provide a seal between the sanitization process and the rest of the dental office. In Europe, there are laws mandating that autoclave doors must remain closed even throughout the drying process. 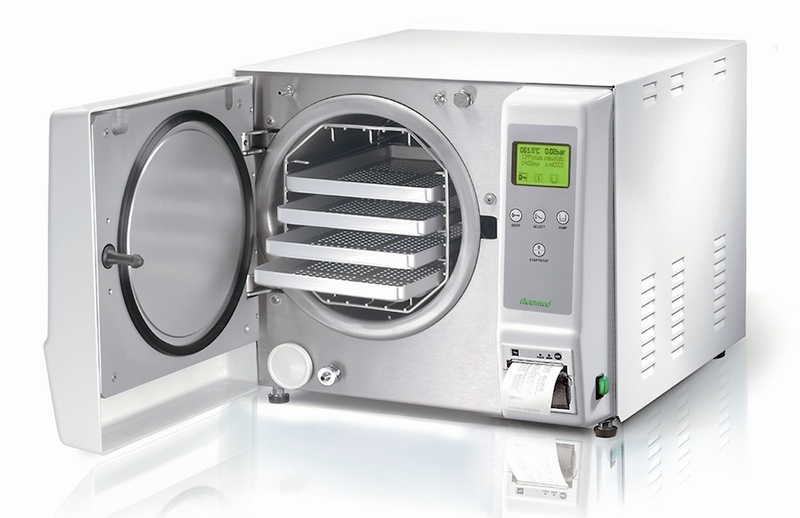 Devices that adhere to these regulations are referred to as “Class-B” autoclaves. In using Class-B autoclaves, European dentists are able to better guarantee complete sanitation as no pathogens can enter the autoclave during the drying process. In the United States, there are no such regulations. If the autoclave door were to remain open, the equipment can theoretically dry more quickly and be used on more patients, thus increasing the efficiency of a dental office’s cleaning regimen. Because of this, many autoclaves in America are equipped with automatically opening doors. American consumers however, have become increasingly concerned with the issue of sanitation, largely favoring the European style of autoclave security above the standard practices in their own country. In terms of the overall market, Class-B autoclaves are more expensive than their counterparts, resulting in more dollars being put into the dental operatory equipment market. Dentists are also guaranteed better sanitized equipment, which they can advertise to their patients in an effort to grow their patient base. Ultrasonic scalers are used as a non-surgical alternative to removing plaque and debris. They use vibrational energy via the oscillating scaler tip to break apart the plaque and a built-in water jet to wash away the debris. Magnetostrictive ultrasonic scalers are more commonly used in the United States, whereas Europeans are more accustomed to piezoelectric ultrasonic scalers. The former uses an elliptical pattern to generate its energy, while the latter follows a linear stroke pattern at a higher frequency. Studies have shown that when applying the same amount of force, removing plaque with a piezoelectric ultrasonic scaler, as opposed to magnetostrictive, results in a smoother surface on the respective teeth. Patients also report less intrusive vibration from using piezoelectric ultrasonic scalers, which leads to a more satisfactory dental experience overall. The role of dental students in the future of the dental industry is integral. Graduating students will have learned their dental skills using the latest equipment, including both Class-B autoclaves and piezoelectric ultrasonic scalers. Schools often receive discounts from manufacturers to use their products in their classrooms in an effort to sell more units initially to the schools themselves, as well as to establish a user base that will enter the workforce in the near future. This trend can be seen in other parts of the world, such as Japan, where dental schools are driving the acceptance and uptake of CAD/CAM technology. As the baby-boomer generation begins to retire in large waves, and new graduates enter the industry, one can expect the Class-B autoclave and piezoelectric scaler markets to reach peak success. More on the dental operatory equipment market in Europe can be found in a report suite published by iData Research entitled the Europe Market Report Suite for Dental Operatory Equipment. The suite covers reports on the following markets: Dental Treatment Center & Multimedia Systems, Dental Handpieces, Dental Scalers, Curing Lights, Caries Detection Devices, Intraoral Cameras, Dental Autoclaves, and Dental Management Software. Reports provide a comprehensive analysis including units sold, procedure numbers, market value, forecasts, as well as detailed competitive market shares and analysis of major players’ success strategies in each market and segment. To find out more about dental operatory equipment market data or procedure data, register online or email us at [email protected] for a Europe Market Report Suite for Dental Operatory Equipment brochure and synopsis.